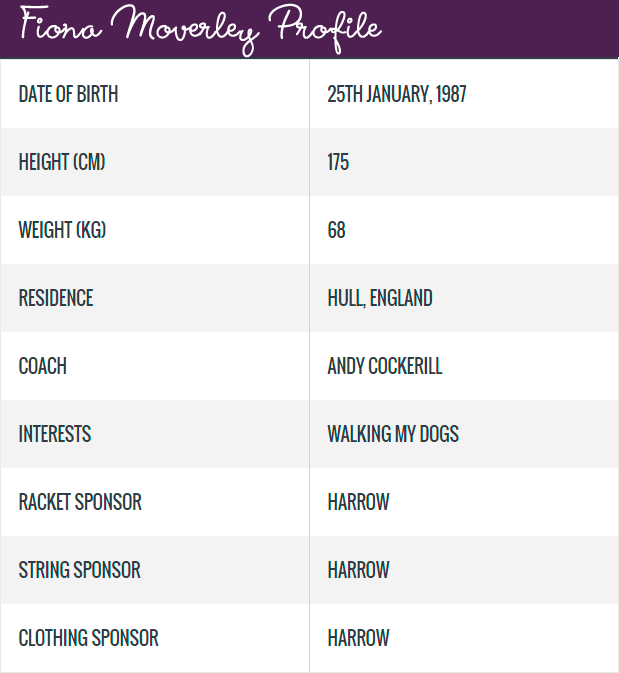 Fiona Moverley, (born 25 January 1987 in Hull) is a professional squash player who represented England as a junior. She reached a career-high world ranking of World No. 22 in November 2017. She made a magnificent comeback though in October 2014 as she lifted the Tasmanian Open and, despite being unseeded for the tournament, she romped to the Edinburgh Open title with a win over number one seed Lucie Fialova on the way. Her progress was compounded in July 2015 when she moved into the world’s top 55 players, 155 places above where she was ranked at the same time the previous year. England’s Moverley had a couple of runner-up finishes to her name in 2015, both at the 42nd Geneva Open and the Dafi Consult Invest Squash Open – where she lost out to Hania El Hammamy and Millie Tomlinson respectively. Moverley then claimed victory at the Open International des Volcans, beating Chloe Mesic in the final. She then went on to win a bigger title by winning the Delaware Open the next year after beating Nikki Todd to seal her third PSA World Tour title since her comeback. Moverley was also named PSA Player of the Month for her exploits and she also broke into the world’s top 30 for the first time in her career in 2016. The start of 2017 couldn’t have come better…her first tournament saw her to gain her biggest title to date in Nantes, France. She then came runner up in her next competition in Canada. This took her to her career high ranking of 24. Fiona has her sights set on top 20 this season so follow her progress throughout the year.